The 30-inch-tall Arisun Bruiser tires proved to be a bit too large for this build; a 28-inch tire would work better for this machine. By the staff of Dirt Wheels. 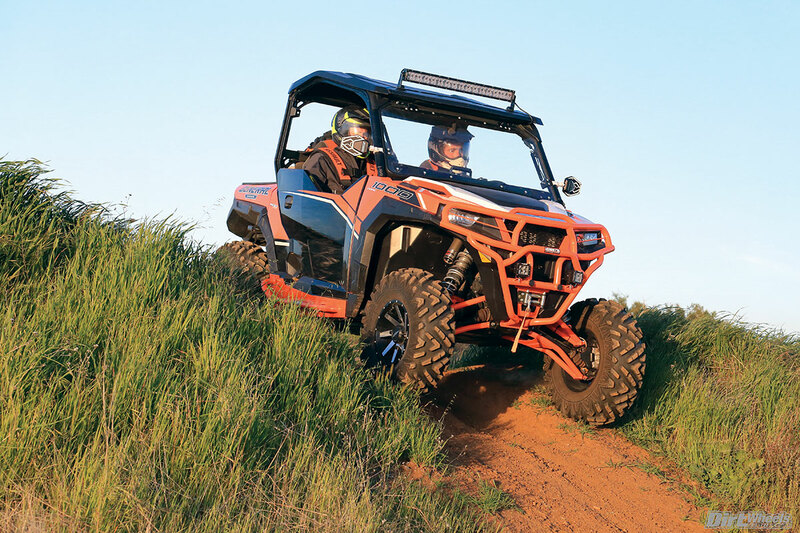 The Polaris General brought a new flavor of fun to the UTV industry. 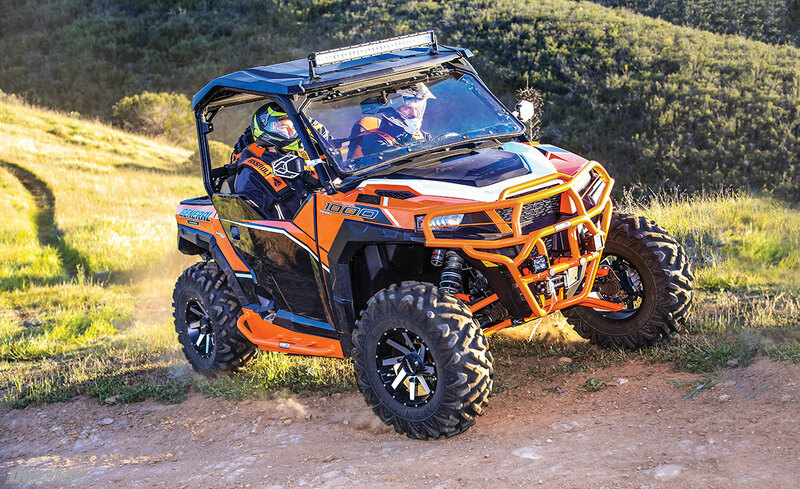 Polaris decided to further bridge the gap between the sport performance class and the utility class with a more recreationally inclined machine that offers more comfort and capability than any machine previously built for either class. 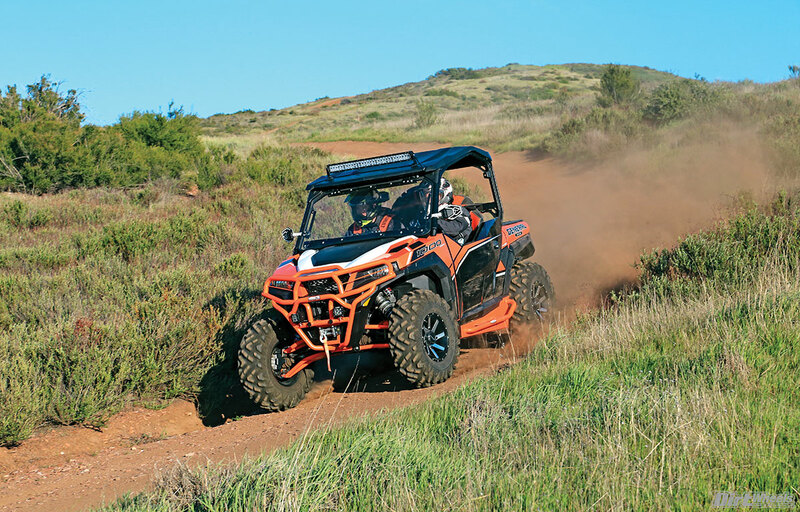 We picked up a Polaris General 1000 Deluxe model and decided to build it into a more-than-trail-capable machine. We envisioned a UTV that could go almost anywhere that would be able to take a ton of parts and tools with it. Fortunately, the General handles like a sport machine yet can hold up to 600 pounds of cargo in the bed. We had the perfect platform. When the General was first released, the team at High Lifter was the first to jump on board this project with us, and they provided high-clearance A-arms for the front and rear of the machine that are also stronger and more durable than the stock ones. The arms provided more ground clearance to tackle bigger rocks, fallen trees and any other difficult terrain you come across. The rear A-arms are raked an inch and a half rearward and provide an inch and a quarter more ground clearance, while the fronts move the hubs forward an inch and a half for clearance without changing the ride height. We could also utilize the stock axles with these kits, which was a major bonus. We wanted to improve the ride of the General while also getting shocks that can handle the amount of weight we were about to pack onto the machine. A call to Walker Evans Racing gained us a set of 2.5 Piggyback shocks that have a larger oil and oil-flow capacity, which helps increase handling in the full stroke of the shocks and heavily increases bottoming resistance. We had to wait to finish setting up the new shocks until we had finished bolting on all the parts of this build so they could be properly set up for the weight. Traction and control are very important. This machine needed new tires and wheels that wouldn’t be too heavy while helping the General roll over terrain easier and increase its ground clearance. We wanted a bigger tire with a stronger sidewall to prevent flats, so we chose Arisun 30×10-14-inch tires for all four corners and included a spare as well. We also wanted to widen the 60-inch General a little bit so we installed some Raceline Twist rims with a wider offset than stock. Mac’s Custom tie-downs sent us a tie-down kit and an anchor rail system for the build. They also built a tire strap to help us tie down a spare tire. A Polaris Northstar cooler was also added to the build. As you can see, we love using it! Our main influence for this build was to turn our General into a machine similar to a Jeep. 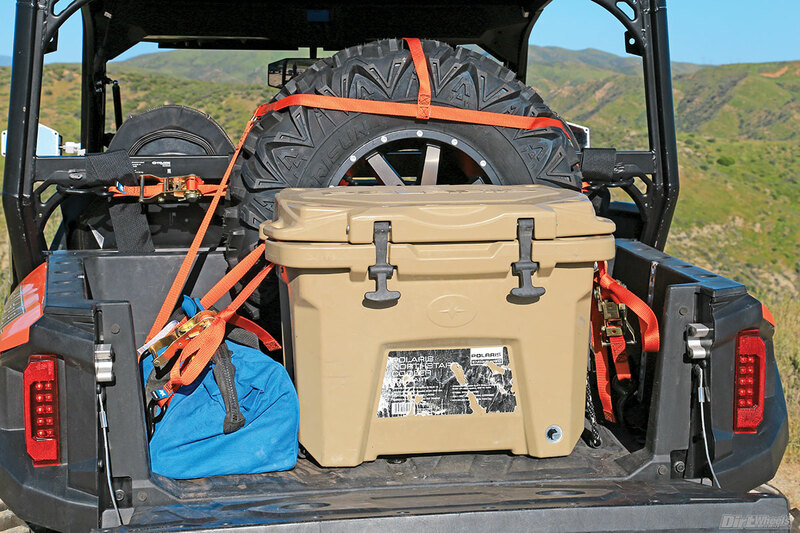 Jeep guys pack equipment onto their rigs and hit the trail, often for remote overnight trips where you need enough tools to fix problems and storage for food and water. We picked up a few kits from Mac’s Custom Tie Downs to help pack the items we needed on our build. First, we had them custom-build us a track system to add adjustable tie-down points in the bed of the General. Then Mac’s built us a system for strapping down a spare tire in the bed and sent a 1-inch ratchet strap kit to crank down tools and equipment. 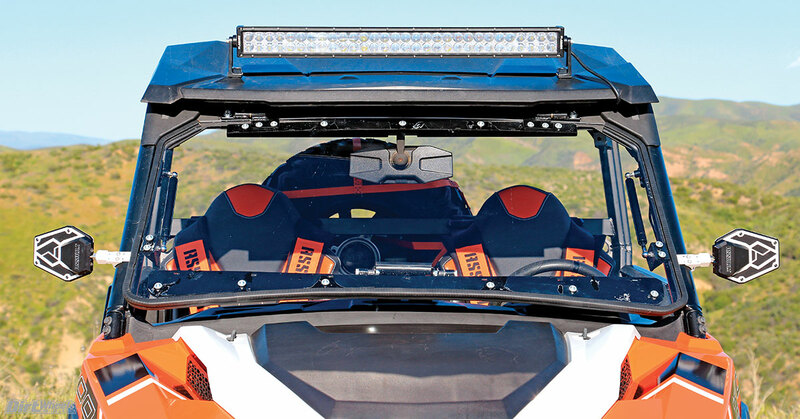 SuperATV has a flip-up windshield system that works great. It can be driven in the open, partially open or closed position. We installed Assault Industries’ B2 Bomber mirrors that work great, and the Slasher LED light bar is very bright. We filled the bed with a Polaris Northstar 30-quart cooler that you can purchase through Polaris’ accessory shop, along with the spare tire and a custom UTV tool kit that we put together. You can find a spare CVT belt, a tire-patch kit, mini tire inflator, clutch cleaning tools, duct tape, electrical tape, wheel-changing tools and more in it. We wanted to make sure we had a jack in case a tire change was needed, so we picked up a UTV jack from Hi-Lift (a company known for jacks it makes for Jeeps). Its heavy-duty jack for UTVs is more than capable of lifting our machine. 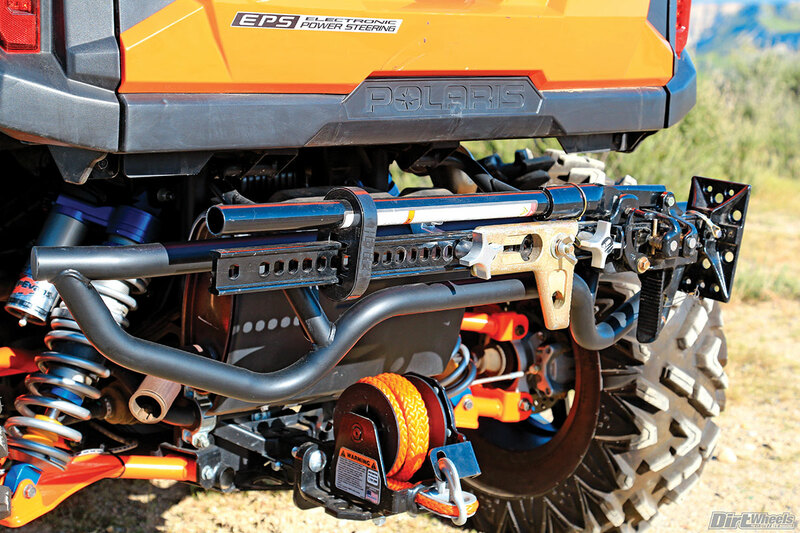 Hi-Lift has a UTV-specific jack that we mounted up to a Polaris Accessories rear bumper. We also installed a TigerTail tow-hook system in case we need to pull someone to safety. Fortunately, the General Deluxe model comes with a winch in case we get stuck in some mud or on a sketchy bit of terrain. We often ride with a buddy whose machinery often breaks down, so we just didn’t feel right about not having a helpful system at the rear of our machine. When he breaks down—again—TigerTail has a retractable tow system that can be mounted to a hitch receiver. The TigerTail UT has a 12,000 pound-rated rope. You never know what you may come across on the trail. Giant boulders, trees, thick brush and more may stand in our way, so we installed a Vendetta Motorsports heavy-duty front bumper that covers most of the front of the General, protects the stock headlights and has multiple mounting points for extra lights. Slasher provided this build with two LED pod lights with a flood pattern that we mounted on the new bumper and a 30-inch LED flood- and spotlight bar on the roof. Vendetta also provided a set of heavy-duty rock sliders. At the rear of our build, we went with a Polaris Accessories rear bumper that we mounted our Hi-Lift jack on. Machine protection takes a back seat to passenger and driver protection. The stock seatbelt system is fine, but we prefer a safer five-point racing harness setup. Assault Industries’ harness system is fully adjustable five different ways and keeps us planted in our seats. The padding and strap covers are removable so you can wash and dry them separately from the machine. We installed one product that might not be an important safety measure, but it does help with comfort and protection from bugs or roost. Super ATV has a flip-up windshield that is specifically designed for the General. You can have it fully closed, partially open or all the way open. When the windshield is propped all the way open, it doesn’t flop or move much while driving. The bigger tires and High Lifter high-clearance heavy-duty control arms allowed the General to have higher ground clearance and not get caught up as easily on rocks, fallen trees and trail debris. First things first, we wanted a Jeep-like UTV and we built one! It isn’t lightweight, it has a lot of equipment mounted on it and is ready for adventure. Even with all of the parts we added to it, there is still plenty of cargo bed space for camping gear for the awesome overnight trail expeditions we like to go on. Once we bolted on all the extra weight, we knew suspension was going to be an issue. Walker Evans set the shocks up properly for the weight, and their shocks handle better than the stock ones. The Walkers bottomed out far less often, They helped the General handle corners a lot better and reduced the feeling of body roll. The dual-rate spring setup let the machine shred over smaller chop like rocky- and root-covered terrain, and then take big hits like desert whoop sections. If we adjusted the stock shocks, they still would never have kept up with these Walker Evans. 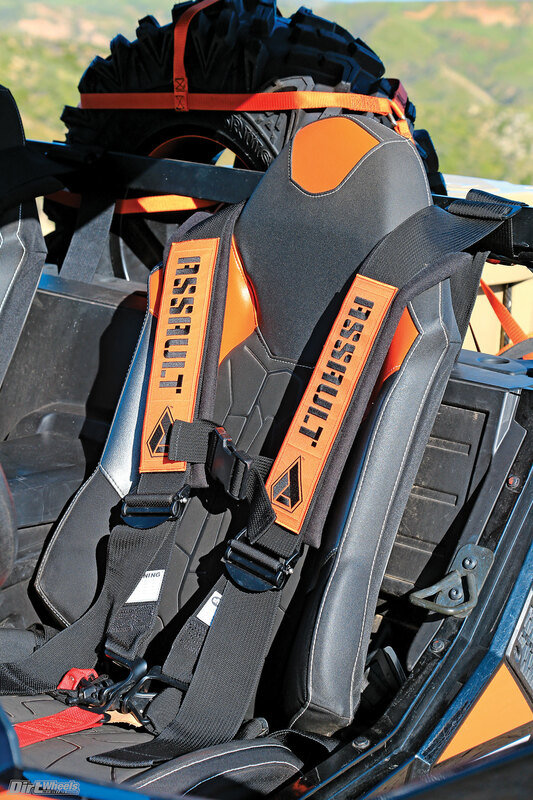 Assault Industries has five-point harness systems with removable padding for washing. They hold us steady in our seats. The High Lifter high-clearance A-arms added a longer wheelbase and allowed the General to avoid hanging up on terrain. The addition of a wider footprint due to a wider offset wheel gained stability in corners and crossing cambers. The Arisun tires provided good traction, and they rolled over terrain a lot better than the stock 27-inch tires. After testing, we realized that the new 30-inch tires are simply too big for the General. They rubbed the bed and plastics when they bottomed out, and they slowed the Polaris down. Changing the clutching would have helped, and we like the Arisun Bruisers, but we would suggest getting a set of 28-inch tires! We feel a lot more confident on our excursions while carrying a jack, spare tire, toolkit, cooler and more. The only attachments we felt were missing were a spare gas and water can, a fire extinguisher and a GPS. Fortunately, the Deluxe model of the General already came with a sound system! There is still a lot of fun to be had with this project, and part of what we love about these machines are the adventures they take us on.